The boys and girl tennis teams at Destrehan High School are expecting some great things this year. Because of Hurricane Katrina, the girls and boys teams have only one team in their district. They are scheduled to play Hahnville on Friday.However, both teams have been playing since mid-January and are doing well. Of course like most spring sports, their season starts without a lot of their players due to other sports overlapping, but Destrehan has managed to gain momentum as all of the players joined the team. The boy’s team, coached by Lamica Esteen, has stacked itself with some strong players who are committed to hard work. The team members in order of ranking are Charley Jones, Matthew Clay, Bret Schexnayder, Russel Schexnayder, Travis Versher, John Lotshaw, Daniel Gutierrez and Merlin Sumter. 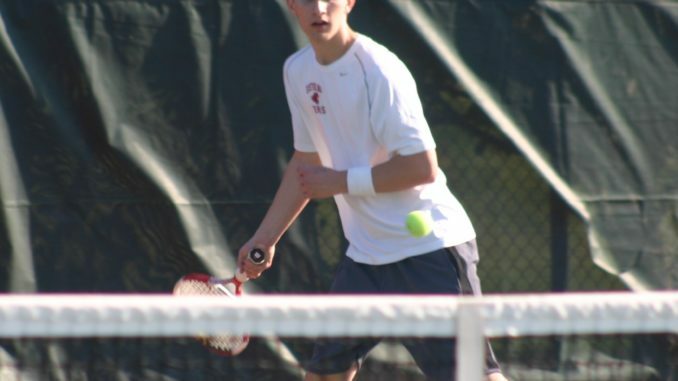 Jones has competed across the country through the USTA National Championship in places like California, Florida and Maryland. He is scheduled to participate this summer in Michigan. “All of these players are dedicated, and I am looking forward to playing Hahnville and moving on to regional,” reflected Coach Lamica. The girl’s team is coached by Sam Buhler. “We are a young team with lots of potential,” said Coach Buhler. “These girls are dedicated, and I enjoy working with them.” The team consists of Taryn Ramsey, Ashley Able, Kelly Carlson, Valicia Miller, Kayla Tuircuit, Danielle Saucier, Chelsea Anderson, Ashley Roy, Macie Waguespack, Kelly McCloskey, Krystal Weber and Megan Dempsey. Taryn Ramsey, the top seed on the girl’s team, has been with the team for 3 years. “I think we are really good as a team, and I look forward to another season,” said Ramsey, adding she would like to see the team improve overall skills and just have fun. “Nothing is worth doing unless you have fun with it,” said Ramsey.